FortuneJack is an online casino famous for accepting a wide range of cryptocurrencies. In this casino, you can deposit and wager Bitcoin, Litecoin, Zcash, Ether, Dogecoin, Monero, and Dash. This is not some little experimental cryptocurrency casino; it is a full-size well-functioning online casino with table games, video poker and hundreds of slot machines. 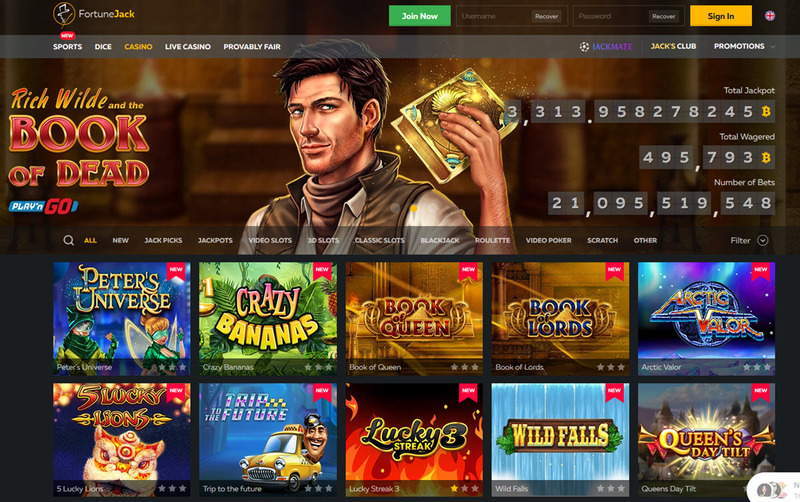 Many of the world’s most renowned game developers for online casinos are represented in FortuneJack Casino, such as NetEnt and Microgaming, and there is a live casino where many of the tables are run by Evolution Gaming. FortuneJack Casino is run by Nexus Group Enterprises N.V, a company established in 2014 and headquartered in Curaçao. The casino has a gambling license from Curaçao. FortuneJack Casino is only available in English. FortuneJack Casino is home to several hundred slots, including advanced slots with 3D-feeling and slots with huge progressive jackpots. You can for instance play the famous old-school looking Microgaming jackpot slot Mega Moolah here, or the modern-style stylish A Night in Paris from Betsoft. If you’re looking for something out of the ordinary, we suggest Crystal Land – a slot with seven reels. FortuneJack offers both live table games and non-live table games. There are a lot of different versions of roulette and blackjack here, but you can also play games such as baccarat, casino poker games and dice games. The assortment includes live-dealer dice, which is a bit unusual. There are 20+ live roulette tables in this casino, plus seven non-live ones. There are about three dozen blackjack tables at FortuneJack, and 30 of them are in the live casino. There are four single-player keno games in FortuneJack Casino: Keno, Klub Keno, Instant Keno 40 Ball, and Instant Keno 80 Ball. You can access the casino in the web browser on your mobile device. Regrettably, some of the slots are not available for mobile play. If you are interested in high stakes gambling, we suggest a visit to the VIP Blackjack table called VIP E, where the maximum bet is 500 mBTC (or the equivalent in another of the accepted currencies). At the VIP Roulette, the max bet is 300 mBTC or equivalent, and there is also a Live Baccarat table at FortuneJack where you can bet up to 250 mBTC or equivalent. Also of interest for high stakes gamblers are the Gold Rush and Dragon Tiger games where it is possible to bet 900mBTC or equivalent per round. As mentioned in the intro, FortuneJack is a casino that accepts several different cryptocurrencies. You can deposit and withdraw Bitcoin, Litecoin, Zcash, Dogecoin, Ether, Dash, and Monero. Deposits are instant, and withdrawal requests are processed in less than 24 hours. In many cases, you request will actually be processed and the transaction completed within just a few minutes. FortuneJack does not charge deposit fees or withdrawal fees. There is no lower or upper limit for deposits. For withdrawals, there is no upper limit, but the various cryptocurrencies do have limits for how small a withdrawal you can make. For instance, you can not withdraw less than 0.004 BTC when withdrawing in Bitcoin. Regrettably, there is no phone support. Email support and live chat support is available. The email address is support@fortunejack.com.